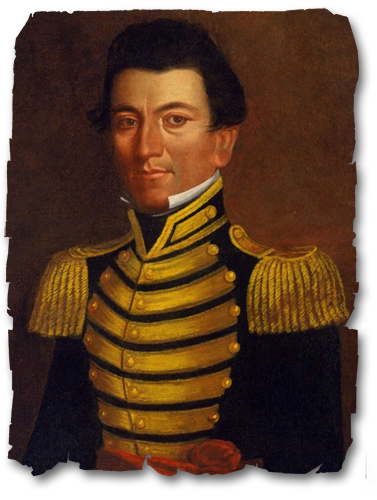 Juan Nepomuceno Seguin was born in the northern frontier of New Spain in San Antonio de Bexar Tejas in 1806 as was his father and Great Grandfather before him. Juan Seguin was destined to live under the flags of Spain, Mexico, Republic of Texas, the United States, the Confederacy, then United States for a second time. Seguin was the first to sound the alarm regarding the danger to Texas and its’ citizens from the new government in Mexico. He declared, “Texas shall be free and independent or we shall perish in glorious battle”. Appointed a Captain by Commander Stephen F. Austin in the Texas Army he fought in a revolt against dictator Antonio Lopez de Santa Anna. Seguin fought in all major battles leading up to the ultimate battle at San Jacinto. The Tejano Capt. Seguin distinguished himself at the Battle of San Jacinto were Texas won its’ independence from Mexico. For his outstanding service, bravery and heroic fight for Texas, President David G. Burnet Commissioned him a Lt. Colonel in the Republic of Texas Army. Seguin became a target of late comers to Texas from the United States who resented Seguin’s status as Mayor of San Antonio. Several falsely accused him of collaborating with the Mexican government in an effort to retake Texas. For the safety of his family and his own life he moved his family to Mexico among those whom he had raised his sword. Santa Anna ordered his arrest and gave him the option of fighting for Mexico or rotting in prison and his family left out in the street begging for food…what choice did he have?…as a husband and father, what would you have done? Seguin eventually returned to Texas, his reputation was restored and his name cleared. The township of Walnut Springs voted to change the towns’ name to Seguin in honor of Juan Seguin He had been the Mayor of San Antonio twice, Justice of the Peace in Bexar, Texas Ranger, elected Senator of the Republic of Texas 2nd. 3rd & 4th Congresses, Wilson County Judge and served Texas in various other capacities. He was the only commissioned officer to fight shoulder to shoulder with Bowie, Crockett, Travis and our other Texas Heroes that perished at the Alamo. He survived to fight for Texas Independence at San Jacinto. Seguin conducted the burial for the Alamo defenders remains that could be found. He gave them a Christian burial with Military Honors. He was one of the joint committee of the Texas Senate and House of Representatives empowered to select the sight for the capital of the republic.